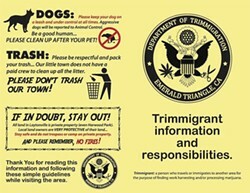 An excerpt from Laytonville's trimmigrant guide. 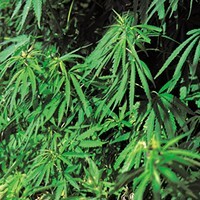 Every year, hundreds of people travel to the Emerald Triangle in hopes of making a few grand trimming cannabis during harvest season. Some use that money to finance further world travel. Some stay in the area, hitting the wall of the region's limited housing market and washing up in homeless camps. These seasonal workers, dubbed "trimmigrants," often tax the resources of the small, rural communities where they arrive looking for work. In response, groups have put together guides for both workers and employers, with tones ranging from annoyed to earnest. 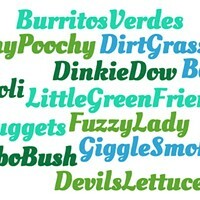 In a Facebook screed that went viral last September, Nevada County copywriter Mike Mooers explained that while the "wonderful mix of cultures, languages, alpaca ponchos and accumulated experiences brings great color to the community," trimmigrants should not trash the river, exhaust the Food Bank or call him "bro." "There's a perception that the taking is beginning to outweigh the giving," Mooers concludes. "One that sees the transient trimming community as a parasite, not a contribution." Mooer's rant is a grittier version of a pamphlet distributed in Nevada City earlier that year. "An Etiquette Guide for Trimmigrants and those that Employ Them" reminded visitors that the region was at severe risk for wildfires and asked them not to exploit the town's Gratitude Bowls program, through which local restaurants give free lunch to the needy. Litter, illegal camping, fire danger and poor pet etiquette are common themes. 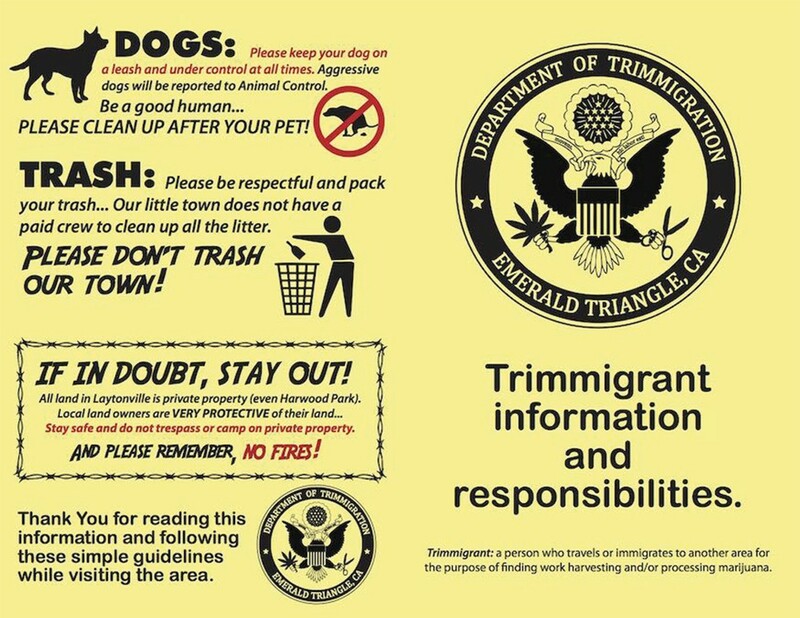 A Laytonville pamphlet reminds trimmigrants that the small community simply does not have the infrastructure or resources to support a large influx of seasonal workers. The area has no crews to clean up litter, no food banks, no public restrooms and no campgrounds. In Garberville and Redway, the C.H.I.L.L. Group (Community Help In Living Locally) and Ladies Who Do Stuff club put together a resource guide with excerpts from the ethical code developed from the 1889 National Hobo Convention, which includes perennial good advice such as "try to stay clean." C.H.I.L.L. encourages visitors to be like Bigfoot and practice "Leave No Trace Camping." As C.H.I.L.L. reminds would-be wood dwellers, "If Bigfoot can do it, so can you!" Farther inland, Mattole Valley residents collaborated on a "seasonal workers guide," explaining there are no public services such as sewage and garbage pickup, no hospitals or free camping in the tiny towns of Petrolia and Honeydew. The guide, which should be distributed this season (full disclosure: your author helped edit the guide) touches on the usual sore spots — trash, fire safety, public restrooms — but it also encourages worker safety. Several trimmigrant guides remind visitors that the industry is not without its dark side. 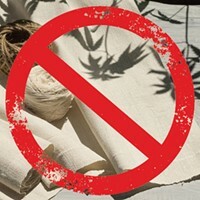 Sexual assault, violence, human trafficking, fraud and worker abuse have all been reported in the cannabis trade. Several guides caution travelers against working for people they don't know and signs posted in Garberville encourage people to seek work with a buddy. It's unclear what kind of impact these guides will have or how long they will be necessary. But they're probably more effective and comprehensive than previous efforts, which included a blip of graffiti on a road sign between Whitethorn and Briceland, with the scrawled message, "Call Your Mom." Linda Stansberry is a staff writer with the North Coast Journal. She can be reached at 442-1400 extension 317, or by email using linda@northcoastjournal.com. Her Twitter handle is @LCStansberry.